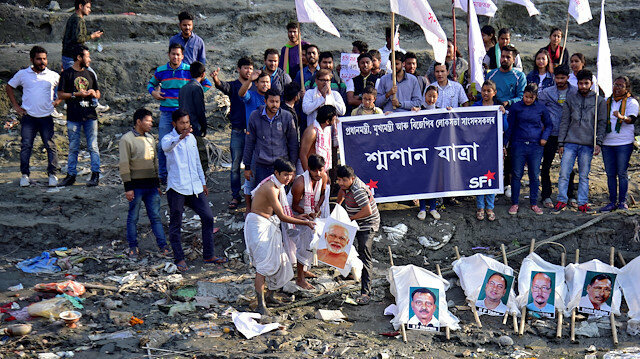 Activists from the Students Federation of India (SFI) perform a mock funeral of India's Prime Minister Narendra Modi and other leaders from India's ruling Bharatiya Janata Party (BJP) as part of a protest against the government's bid to pass a bill in parliament to give citizenship to non-Muslims from neighbouring countries, in Guwahati, India, January 9, 2019. Indian police on Friday said they are investigating an academic, a journalist and a peasant leader for possible sedition for publicly opposing a proposal to grant citizenship to non-Muslims from neighbouring Muslim-majority countries. Critics have called the proposal blatantly anti-Muslim and an attempt by Prime Minister Narendra Modi's Hindu nationalist Bharatiya Janata Party (BJP) to boost its Hindu voter base ahead of a general election due by May. The cases have been filed amid a wave of protests in the BJP-governed northeastern state of Assam. A small regional party in India quit the ruling coalition on Monday in protest against the plan. The Modi government is facing growing criticism for stifling criticism, including in the media. A television journalist in the region was jailed last month for criticizing the government on social media. "We have registered a case against a few people based on certain statements that they made at a public rally in Guwahati," Deepak Kumar, a police official from Guwahati in Assam, told Reuters. The three have not been charged. Many people fear such a move could change the demographic profile of Assam, where residents have for years complained that immigrants from Bangladesh have put a big strain on resources. Hiren Gohain, an 80-year-old academic, peasant leader Akhil Gogoi and journalist Manjit Mahanta have been accused of criminal conspiracy and attempting to wage a war against the government, Kumar said. The bill, which seeks to give citizenship to Hindus, Sikhs, Jains, Buddhists, Christians and Parsis from Afghanistan, Pakistan and Bangladesh, has been passed by the lower house of the parliament. The bill will be tabled for approval in the upper house in the next session, where it is expected to face resistance from the opposition Congress party. The BJP does not have a majority in the upper house of the parliament.